The village of Carna, Co. Galway. A village in County Galway uses DNA testing to connect with people whose ancestors immigrated to Portland, Maine and other places in the U.S.
Maybe I am so excited about the partnership between the Carna Emigrants Centre and the Maine Irish Gaeltacht Project because I spent almost 40 years searching for my Irish ancestors. I spooled through miles of microfilm, asked vague questions at the doors of parish houses throughout Ireland and then was completely overwhelmed with the floods of information that hit the Internet. So much and so impersonal. But now I only have to walk into the old Carna National Schoolhouse with its glorious views of the sea, settle myself in a room modeled on an Irish country kitchen, share the results of the analysis I did on Family Tree DNA with a real person, then sit by the fire as I not only learn about the past generations of my own family but very likely meet present day cousins. The community has always been proud of native son John Ford, whose real name was Feeney. A relative of his, Margaret Feeney, has for many years helped members do genealogical research and create their family trees. Using traditional methods she developed a database of 130,000 names, most connected with the Connemara Gaeltacht, which stretches from Bearna/Spiddal along the west coast of Galway Bay to the area around Carna, Kilkeerin and the Lettermore Islands. Then in 1997 the threatened destruction of St. Dominic’s, for 175 years “the Irish church” in Portland, galvanized the community. They campaigned to save St. Doms, taking their case all the way to the Vatican. But the parish was closed. So they lobbied the city council to buy the complex and allow the church building to become the Maine Irish Heritage Center. They won. The center, which opened in March 2002, now has an extensive library that in-cludes genealogical works and schedules events such as lectures, ceilis, book clubs, Irish Masses, weddings, music sessions as well as holding the annual Claddagh Awards Dinner. Now Margaret Feeney’s genealogical project had a home. Then Maureen and other Center members became fascinated with the possibilities of DNA testing. Three hundred of them used Family Tree DNA to assemble profiles that showed how Irish clans in Portland intersected. Then Maureen thought, why not extend the testing to people in Connemara, where most Portland families had originated? “She swabbed a whole lot of us,” Mairtin O’Cathain, journalist, radio presenter and Chairman of the Carna Immigrants Centre Committee, says. I am sitting with Joe, Mairtin and Susan O’Cathain and another Committee member Josie Curran in the Carna Bay Hotel, looking across at the schoolhouse that will one day be the Centre. Neighbors and strangers will be united in that most enduring of human experiences – telling stories by the fire. “Growing up, every evening one or two people would appear in our kitchen,” Mairtin remembers. And though Mairtin and Joe checked e-mails on their cell phones, and the young people passing the hotel would have fit in on any city street in the U.S., in this part of Connemara where 96 percent of the people still speak Irish and are connected to their heritage, a sense of the eternal Ireland is so strong that I felt I was now part of the circle Mairtin had described. This is the kind of connection the Centre will provide, one that Carna is uniquely suited to offer. 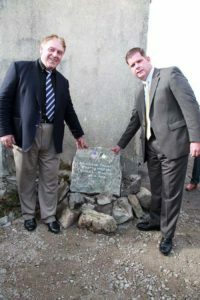 TOP: Martin J. Walsh, Mayor of Boston unveils the Foundation Stone for the Emigrants Commemorative Center in Carna in Connemara in September. Project chairperson, Máirtin Ó Catháin (left) with the mayor. 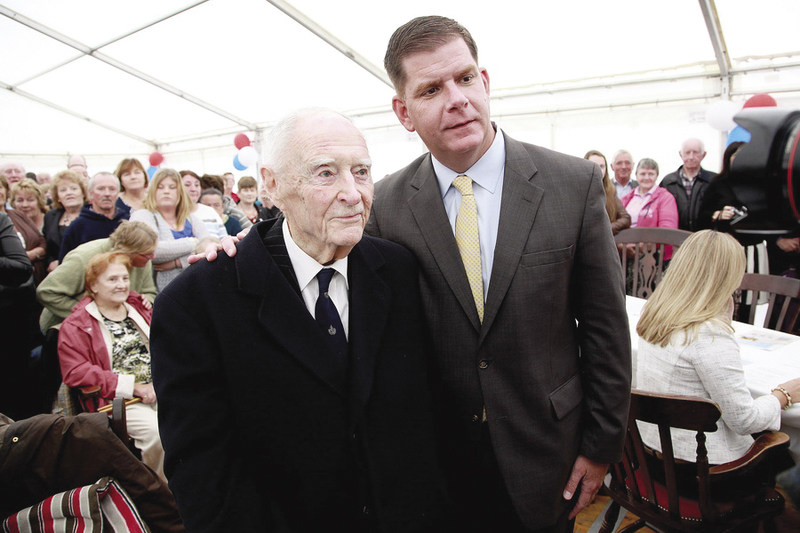 Mayor Walsh’s late father, John Walsh was a native of Carna and his mother Mary is a native of the neighboring parish of Ros Muc. Both parishes are in the Gaeltacht – the Irish speaking area of Ireland. CENTER: Local parish priest, Fr. 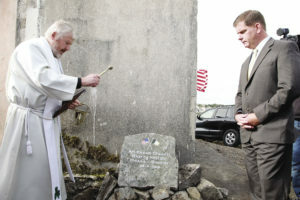 Padraig Standún blesses the Foundation Stone as Mayor Walsh of Boston looks on. 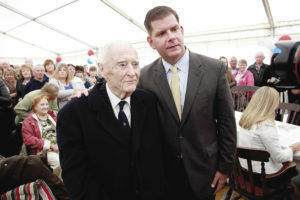 BOTTOM: Former Taoiseach Liam Cosgrave greets Mayor Walsh of Boston at the Emigrants Commemorative Center Foundation ceremony. Mr. Cosgrave went to primary school for a term in the old school building on the site in 1930. Now 94, Mr. Cosgrave travelled from Dublin for the occasion. most learned while he was growing up in Carna. Though he died in 1984, a yearly festival in his honor features local singers such as Johnny Mairtin Larry McDonough who carrys the tradition forward. I saw teenage brothers John and Brendan Joyce, All-Ireland champion Seán-nós dancers perform in a friend’s living room. The music is a part of life as it was for all of our Irish ancestors. So even if you don’t have Connemara roots, you will be connecting with your own past by visiting here. And you may find yourself guided by your ancestors. And so the conversation went as the day drew in and we wove a transatlantic tapestry of who we were and who we are. Did I know White House Chief of Staff, Denis McDonough, has Carna roots? And so does former Maine Governor John Brennan who helped start George Mitchell’s career by appointing him to the Senate? Portland’s present mayor is also a Brennan, Michael. And was I aware that both parents of Boston Mayor Marty Walsh were born in the area – his father John in Callowfeenish and his mother Mary O’Malley in Rosmuc. I did know Mayor Walsh’s story having read about it in Irish America. The group then describes the emotional moment when Marty Walsh dedicated the foundation stone of the Carna Emigrant Centre in September 2014. “Bonfires lit up the hills and the whole place was covered in American flags and signs that said ‘Fáilte Abhaile, Mayor Marty Walsh’ and ‘Welcome Home!’” Mairtin remembers. Over 500 people came to the dedication of the Emigrants Centre cornerstone and another 1000 to the reception in Screebe House, a sizeable portion of the population of the area. Marty Walsh had his mother by his side and was surrounded by cousins as he greeted the crowds in Irish. Reporting on the visit, The Boston Globe found that the most affecting moment came when, during an Irish language Mass, schoolchildren dramatized an emigrant’s journey. “Walsh’s mother, who left Rosmuc at age 17, sat in the front pew and wiped tears from her eyes,” the newspaper said. During his official tour of Ireland Mayor Walsh concentrated on economic development and efforts “to build upon a historic bond and build new dynamic partnerships with 21st century Ireland.” He traveled to Donegal, Derry, Belfast and Dublin and attended the All-Ireland Hurling Final seated between An Taoiseach, Enda Kenny and President Michael D. Higgins. But my friends in Carna are sure the highlight for Walsh was bringing his mother home again to share his hero’s welcome. “You know she never lost her Irish,” Mairtin says. For more information on the Gaeltacht Project go to www.maineirish.com. For the Centre go to www.carnaimmigrantscentre.com. I was delighted with the article about Carna. My grandfather hailed from Callowfinish and grandmother from Mweenish Island. The Mulkerns and the Coynes. I was privileged to meet some cousins on my last visit to Carna. Wonderful people, very welcoming to myself and the people traveling with me. The most beautiful landscape in Connemara, and the surrounding area. I am anxious to visit again soon. All CALLOWFEENISH PEOPLE EMIGRATED TO PORTLAND MAINE YEARS AGO,MUNJOY HILL N PORTLAND WAS FULL OF CALLOWFEENISH emigrants, GOVERNOR BRENNAN’s mother was Mulkerrin from CALLOWFEENISH, my mothers aunts Devine ( devane) all lived there. Loved the article. I have just stumbled across this website. My grandmother, Margaret King, was born in Kilkieren to Martin King and Mary Burke. Altho her family were relocated to Minnesota in 1880, I have several branches of my family who also immigrated to Portland Maine. I will definitely make the Carna Emigrants Center a high priority for my next visit to Ireland! Thank you! Your caught my eye. My great-grandfather was Hugh Conroy, married to Margaret Burke. Both were from Galway and settled in Minnesota. They later (about 1892) moved to San Francisco and Seattle. The 1900 census tells me that they emigrated in 1880 or 1881. Have you any information on the Burke family? Hi Anne – I don’t look at this very frequently, as you can tell. I don’t have a whole lot of info on the Burke family but what I DO know is this: My great-grandmother (Mary Bourke- b abt 1843) was the daughter of a Thomas Bourke of Dooyeher. Info was provided to me from another researcher who suggested that Thomas was the son of a John Burke and Ellen Kelly, both of Carna Parish. I have not personally done any extensive research back this far. This is about what I know…..sorry! Can’t wait to get back to Ireland and do more research! The Cain project at Family Tree DNA was the first to identify a previously undiscovered irish sept named O’Cathain in Connemara, unrelated to either O’Cathain of north Derry or O’Cathain of south Galway. The O’Cathains of Connemara are Y-haplogroup E, perhaps the people who brought agriculture from the Middle East to ireland, now confined to remote coastal regions of Ireland. Now that the Carna Emigrants Centre is working through Family Tree DNA, they might consider working with the several Surname porjects who have been tilling the rocky soil of Connemara for so long now. Having different sets of information in different places is less efficient than combining our knowledge. My family shows up ( Ridge) in the mid 1600’s in Mayo. We are also direct descendants of Conroy (Mason Island). My Grandmother was Barbara Ridge of Culeen, Carna Country Galway Ireland..,.. I am very interested in getting information that is already historical! Hello Kathleen, My grandmother was born in Cuillleen or Culleen on July 16, 1880 to Edward or Edmond Kinavey or Kenavey or Kanavey (or several other possible spellings) and Mary Kilmartin. For a while I thought that was the name of a town but I now think it is just a collection of farms. It is part of the Carna Parish. My mother thinks that her grandparents died in the Spanish Flu epidemic of 1918 in Cuilleen. I have not been able to find any actual documented information about their births, deaths or anything else. I even wrote a letter to the pastor of St. Mary’s in Carna but never received an reply. My grandfather, Peter Foley (born 1890), listed Carna as his place of origin on his World War I United States draft registration card. I know nothing of my Irish roots apart from that. Would anyone know anything that might fill in the huge gaps in my family history? Peter arrived in the US June 7, 1910 and lived in Chicago. UPDATE: Grandfather Peter’s name was actually Folan. He changed it in America. He was born in Half Mace, to Patrick Folan and a woman whose family name was Green. Does this mean anything to anyone? John, During, I have spent a lot of time looking for family information but I am a novice and my time spent yields a nugget only once in a while. On occasion someone who is very proficient in finding information lends a hand–taking pity on an old goat. If you are willing to spend the time you might look at Family Search.org. It is run by the Mormon church and they have excellent resources and you can call for help getting started. As I understand it, the English did not help after they invaded. I have read that they destroyed a lot of the old records, making our searches more difficult. Another challenge is the spelling of names. Apparently standardized spelling did not start until the English dictionary was commonly available some time around the 1830s. My grandmother’s last name was spelled four or five different ways in the records that I have found. Searching in Ancestry.com can be refined to exact spelling or approximate spellings. PS I just received my Irish citizenship through the Irish Department of Foreign Affairs Foreign Birth Registry. If you can find a civil birth certificate for your grandfather or grandmother you can become an Irish citizen. John, there is a Peter Folan born 1890 in Half Mace to Michael Folan and Margaret Green. Are you positive the name was Patrick Folan? I do tons of Carna research (my grandmother was born there) and I would be happy to chat about your details and help research. I just looked at the 1901 census record and I wonder if the reference to Patrick is really his older brother? My email is fitzgerald_terry@yahoo.com. My ancestors are related to the Ridge’s who ended up in Maine… My Grandmother Barbara Ridge Conroy ( 1879 – 1963) of Culeen Carna Galway and my Grandfather was Martin Conroy born on Mason Island and died in Boston July 1918 at abt 41 Years old. Kathleen, I am pretty sure we are cousins. My name is Terry Fitzgerald. My paternal grandmother was born in Carna. Would love to chat more. My email is fitzgerald_terry@yahoo.com. I was in Carna this past week.I followed the towns from my DNA results.from Maine Irish Heritage Center…I did not make it to MacDara Island .I am very interested in the annual festival there .The beautiful area was breath taking .I emailed the center no responses.. I may have had wrong email .We will be back . Much to my delight I just stumbled upon this site while researching for a friend whose ancestors hail from Carna. Her maternal great-great grandparents where Morgan Mulkerrin / Margaret Folan and great grandparents Mark Mulkerrin / Barbara Green(e) and Thomas Cashen / Barbara Grealish. If there is anyone out there with a connection or information pertaining to these families I would love to email with you! My father joseph (born 1895) & his brother John Mulkern were orphaned in Portland ME. Their father Colman was born perhaps on Finis. Joseph went to live with the Feeneys, I have a picture of him with John Feeney (later Ford) on the 1912 high school football team. Since my dad died when I was only eight, I don’t know much about him. Any info would be much appreciated. thanks! The Mulkern’s in my family are from Callowfinish. We are in Portland Maine. Are you in Portland too? My Uncle Martin Davis was married to Ann Walsh from Callowfenish Mary Walsh Aunt. Ann taught me how to ride my bicycle, she was an absolute angel, she lived in Paradise, Eyrecourt fro some years when I was very young, we had great fun, she then immigrated to Boston as all her family were there, and I visited them many times, I have so many first cousins from that family in Boston. Well done Mary. Hello. Although I am not from Portland, I stumbled upon your site here when looking for some information about Carna. My mother emigrated to the US when she was 12 years old from Mace. She was born in her father’s family home (last name Bullistron) and her mother was from Mynish (Mweenish, Muignis, etc..). She might be able to lend some insight to some of your questions if you would like me to ask. I would like to contact you. I think we are related. My name is thomas j roach III. I am the great grandson of barbara curran born on bir island in 1869. Her parents were tom curran and bridget folan curran, born in 1838 in the carna area. they also lived on roisin an bholgain c. 1872. this curran family was picked by the priest to travel with 10 carna families to americain 1880. they settled in graceville and then moved to st. paul Minnesota c. 1880-1881. i am searching for any curran relatives in the usa and any folan people remaining in the carna townland. i have info and photographs relating to their lives in ireland and usa. Greetings from Connemara, Ireland.I would like to make email contact with Coleen Zinck. We are probably related. I forgot to mention notification.